BRF’s Entrepreneurial Accelerator Program (EAP) has been awarded a U.S. Economic Development Administration (EDA) grant, resulting in the creation of the North Louisiana Entrepreneurial Accelerator Program (NorLEAP), which will expand EAP services to 21 parishes in North Louisiana. 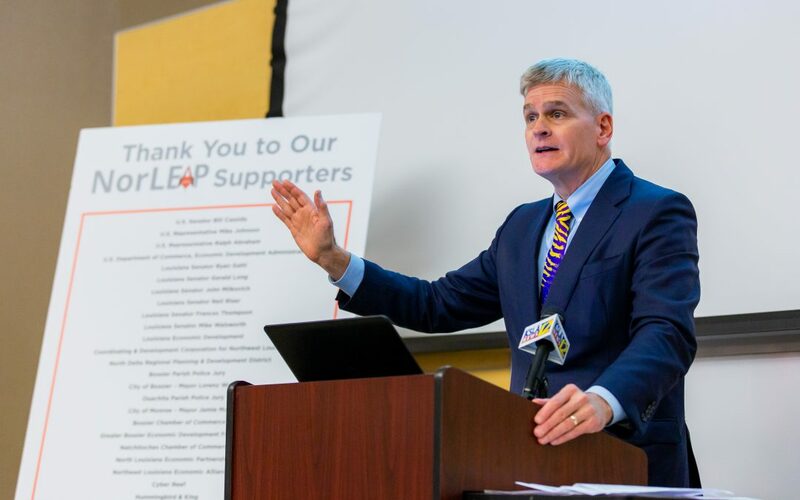 EAP, with U.S. Sen. Bill Cassidy, M.D., and U.S. Rep. Mike Johnson, announced the award on Nov. 2 at Bossier Parish School for Technology and Innovative Learning. Cassidy and Johnson, along with other North Louisiana elected officials and economic development organizations, provided letters of support to secure the grant. The two-year, $600,000 grant will be matched by BRF, creating a $1.2 million expansion of EAP services. Over the next 15 months, the grant is expected to create or save more than 200 jobs and generate $15 million in revenue to the 21-parish region’s economy. EAP is dedicated to helping entrepreneurs grow ideas into businesses by providing them with expertise, mentorship and key connections needed to fuel their success. By assessing the need of the startup/business and reviewing any materials they may already have prepared, NorLEAP will be able to provide entrepreneurs with services that include but are not limited to: marketing and sales strategies, financial analysis and modeling, creation or refinement of business plans and products, pitch decks, and networking opportunities. EAP is a long-term project to create jobs and expand the local and regional tax base through a system that analyzes the viability of ideas and products of entrepreneurs, matches them with informed investors, and nurtures them through the critical steps toward market. With EDA assistance, the NorLEAP Program will continue to foster even more sustainable economic growth throughout North Louisiana. “EAP is a proven model that assists entrepreneurs and high-growth startups in launching and growing their businesses. We are excited to give this same opportunity to entrepreneurs and small businesses across North Louisiana,” said Dave Smith, Executive Director of EAP. EAP is a result of an ongoing public private partnership between the Caddo Parish Commission, the City of Shreveport, and the BRF. Since inception, 691 startups and business ideas have been screened by EAP, the program has provided direct services to more than 222 companies looking to launch and grow locally, and 55 companies have been funded through angel investors, grants or banks. This (report/video/etc.) was prepared by BRF using Federal funds under award 08.69.05253 from the Economic Development Administration (EDA), U.S. Department of Commerce. The statements, findings, conclusions, and recommendations are those of the author(s) and do not necessarily reflect the views of the EDA or the U.S. Department of Commerce.